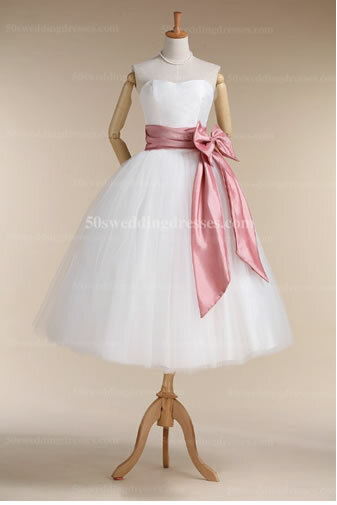 September 27, 2013, 9:08 am -- /EPR NETWORK/ -- 50sweddingdress.com is established as we wish to provide brides top quality, fantastic retro style dresses at affordable prices. We mainly provide 50s vintage tea length wedding dresses, matching petticoats, head veils, bridesmaid dresses etc. Superior customer service will be provided during your consulting and purchasing process, whether you are an individual consumer looking for your perfect gown at an affordable price or a wholesaler looking for a reliable dress supplier to boost revenue. A breathtaking tea length wedding dress selection for the discerning brides, our wedding dress collection is created from inspiration of traditional 50s clothing, which means our dresses combines modern popular elements & charming retro style feeling together. Our designers take great effort on details so as to make those dresses seem elegant and special, such as creating new artful neckline cut & seductive hemline, using gorgeous lace fabric to achieve noble effect, different colored sash are available for brides to choose according to their wedding party's topic color. Wedding dresses could be made in both of standard size & custom made size so as to fit brides' body in the most perfect way. As we know an elegant dress means everything on your biggest day. Our elegant vintage dresses series with functions from evening wear to formal wear for cute bridesmaids to consider, simple & concise appearance will make girls looks decent on different occasions. Dresses will be provided in standard size. Why should you trust us and buying from us? 1) Our Dress Quality & Craftsmanship: Trained and highly skilled consultants, experienced cutters, professional seamstresses are dedicated to make every vintage wedding gown elegant and artful. Our delicate workmanship can be seen from each gown we sell. 2) Our service: Professional and sweet service will accompany customers during the whole consulting and shopping process. Custom measurement, rush and super rush orders, plus size gowns, mix and match different top and bottoms on selected styles are workable. Our friendly and patient consultants will always answer your questions timely. 3) Our Value: We are founded on the belief that each bride deserve to own a gorgeous wedding gown. Your smile and satisfaction is the best feedback for our team's work.